BATHROOM CARPET - New and improved quality and backing bathroom carpets. Wall to wall non-slip carpet for bathrooms. 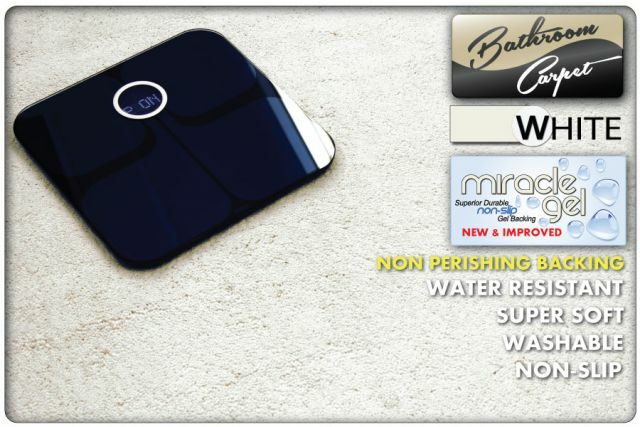 Bathroom Carpet is a great waterproof non-slip solution for bathroom floors. Order bathroom carpet below. 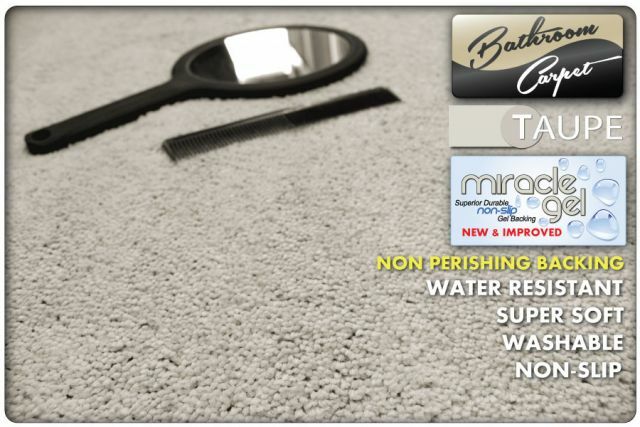 We deliver bathroom carpet Australia wide. 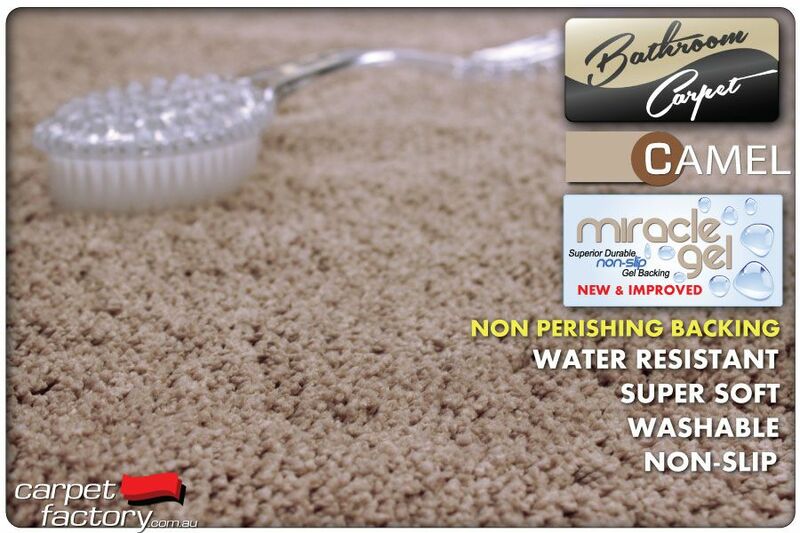 5 great colours available for order now in quik dry waterproof bathroom carpets. Our bathroom carpet is currently available in 5 colours. It can be cut from the roll 2 metres wide. Minimum cut is 1 metre. If you require 3.6 m by 2 m please choose 3.6 as your "length required." Please fill in your details for a quote for pickup only, or delivery Australia wide. 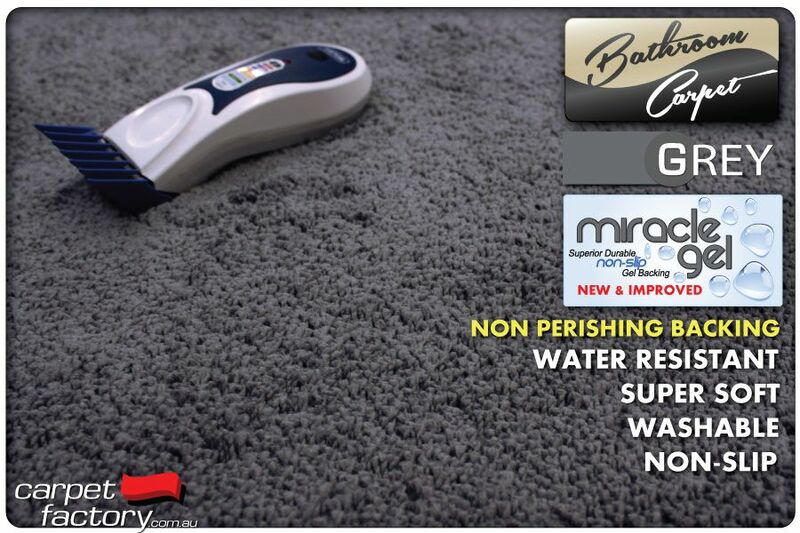 New Premium Super Soft Bathroom Carpet. Water resistant and now available in 5 great colours. Looking to rejuvenate an ugly or old bathroom floor? Or are you worried about slipping and falling after getting out of the shower? Bathroom carpet is a great solution for costly renovations and slippery bathroom floors. But hey, you probably knew that already because you found this page. So here it is. Bathroom carpet that is easy clean and water proof and better than ever with a new non perishing backing. Just fill in the form below for a quote. We courier deliver Australia wide. You can call (02) 62805339 for any queries. Quote form is below. We will call you back at the first available chance. 2 METRE WIDE ROLLS (maximum) Choose any length. Our Bathroom Carpet is available on 2 m wide rolls. It can be cut from the roll to any lengh required. The maximum width is 2 m wide (just over 6 feet 6 inches). However, the length can be up to 20 metres long. The common complaint about bathroom carpets we hear is that the backing is old and falling apart. Taking the initiative we have sourced and produced a premium new formula backing. 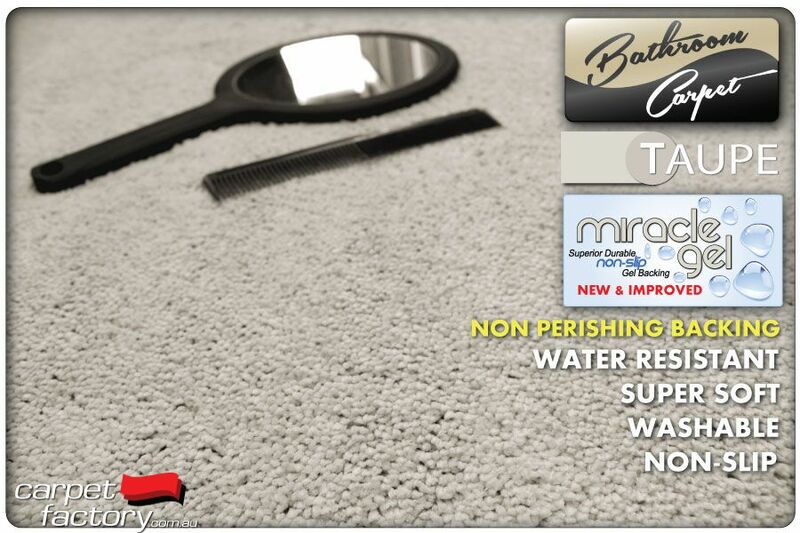 This new high end bathroom carpet backing is "non-fraying" and can be cut to any shape you desire. It will not fray, not dry out and not crumble like regular bathroom carpets. It can be washed and cleaned without perishing, flaking or delaminating (peal off). It is also non slip and grips well to tiles without disintegrating and will not fuse to the tiles or floor beneath like regular rubber backing can. The super soft pile is silky smooth and warm under foot. It also dries well and is very difficult to stain permanentl. Our test show machine or hand washing can clean the carpet like new with just water. A light detergent may be used for heavier stains like grease. In the past, bathroom carpets had a backing that would perish and crumble after only a short period of time. Our new gel back non -slip backing is new and improved with higher durability and perish resistance than previous generation bathroom carpets. Our bathroom carpet sits well on tiled floors prone to slipping when wet. Carpet Factory bathroom carpet is a custom made higher end carpet with a durable textured backing for excellent grip on slippery tiles. Using a fast drying fibre our bathroom carpet will not let water soak in to the yarn causing longer drying times. The backing is also non-porus. Water cannot seep through to beneath the backing, getting trapped where it can cause stagnant water issues. "Just wanted to say how happy we were to find this (Carpet Factory bathroom carpet). It is fantastic. I have been showing it to all our friends and neighbours. You should get some inquiries soon." "We searched everywhere... Every store we went to said you cold not get bathroom carpet in Australia. So glad we found Carpet Factory actually has it"
"Just writing to say thankyou for the fast delivery. The bathroom carpet covers the slippery tiles really well and t feels fantastic to walk on. My eldelry father is showering with confidence... we are very appreciative." 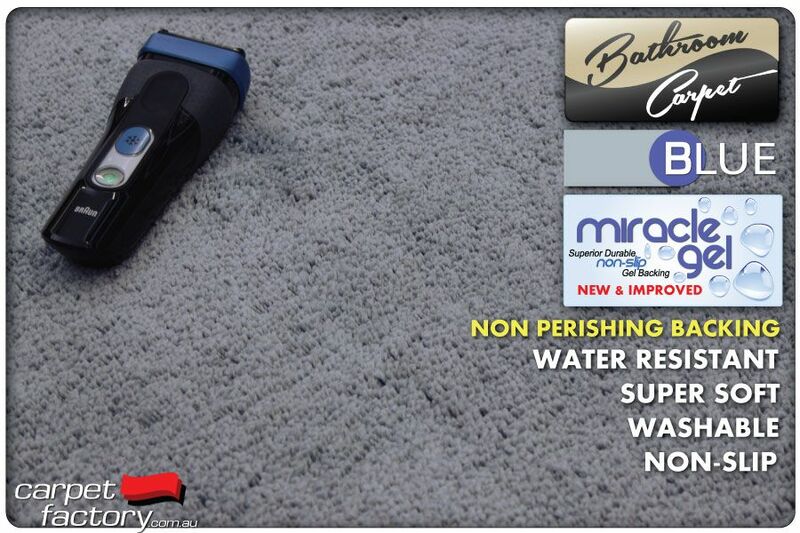 "We ordered the pearl blue bathroom carpet a few years ago and we love it. We wanted to to know what colour you think would best suit our new bathroom? (see picture) We were thinking the white or light grey?" Australia wide courier delivery is available! To request a quote please use the bathroom carpet order form at the top.